A man from Didcot has been handed a four-month suspended prison sentence and banned from driving for six months after admitting dumping waste on rural land in South Oxfordshire. James pleaded guilty to two charges relating to the deliberate deposit of waste. It happened along the Roman Road Bridleway, located away from the A4074 between Berinsfield and Burcot. 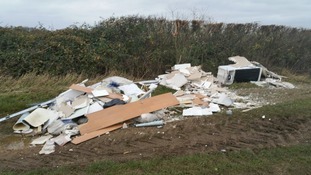 A building company had paid John James £500 to remove the waste. The company also provided details of another job in November 2017 that Mr James had been involved with, this time at an address in Wallingford, along with text messages about the arrangement and a flyer Mr James had used to advertise his services. Despite reminders from South Oxfordshire District Council to provide his waste removal license, he failed to attend an interview or provide any documents. The rubbish was dumped less than five miles away from the Redbridge Waste and Recycling Centre. James had already been convicted of a fly-tipping offence in 2015.